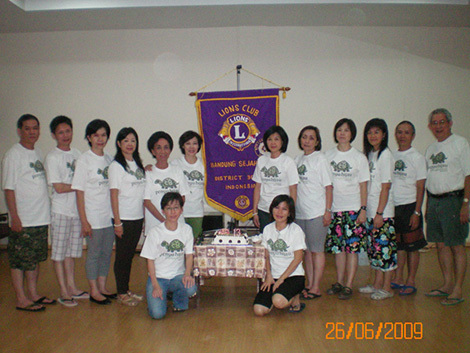 Lions Club Bandung Sejahtera was founded in June 13, 1997 in Bandung, West Java, Indonesia. 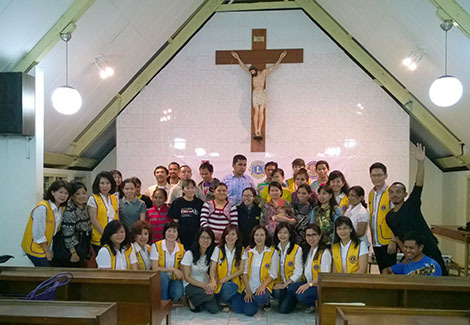 It was the time when a group of young energetic people united their integrity and energy to help the needy. See those smiling young Lion inside the circle of honest spirit that unites club members - you know why he is there, yes - represents fellow members. 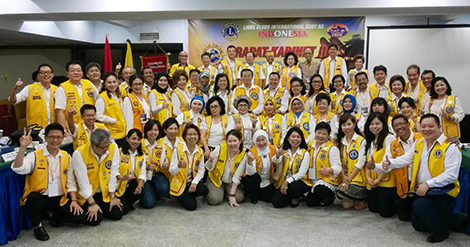 Being part of Lions Clubs community, the Lions Clubs International logo resides close to the Lion's heart, and proudly being Indonesian, red and white nation flag spreads in the logo. Rice is the country's staple food, cotton means clothing, in pairs - paddy and cotton may represent wealth for the nation. The club's anniversary will be remembered easily by a glance at thirteen husk of the golden paddy and six cotton bolls on the logo. 3rd Cabinet Meeting in Makassar, March 21, 2015. One of our Club member is a Zone Chairperson, this picture is taken a while after the meeting closed. LIONS Day. November 23, 2014, Lions vest coloured the streets. On a Sunday car free day along the Dago street in Bandung, Lions Clubs in Region I celebrates Lions Day providing Free Blood Sugar Test for Strides Campaign, Open Aerobic Class on the street and Collecting Trash after the celebration to keep our environment clean. On stage with the legendary Koes Plus Band at Fellowship Nite of 2nd Annual Convention 2014, Solo. May 22, 2014. Participating in SightFirst Project. 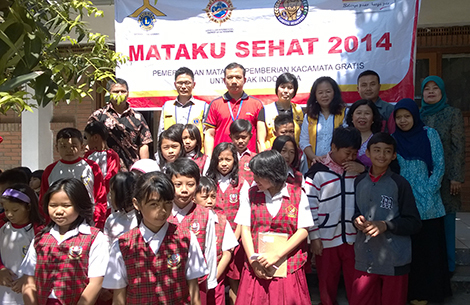 Holding screening test and donating glasses for elementary school students. Club President, members & Zone Chairperson were present at the glasses contribution, March 13, 2015. Fight vision loss. Since the program began in 1990, SightFirst has helped save the sight of more than 30 million people worldwide. Activity Poster Contest. 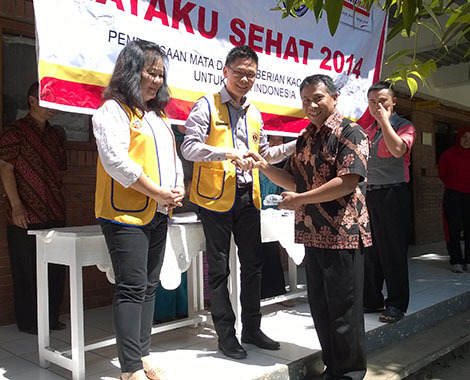 Bandung Sejahtera Lions Club was awarded the first appreciation of District 307B's poster/banner contest. 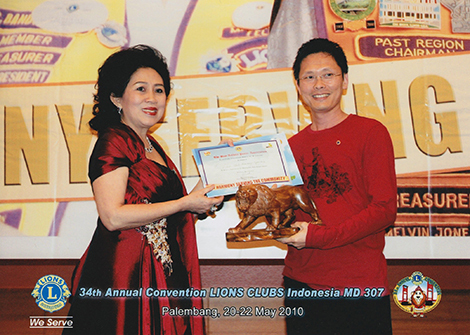 DG Ina L. Gunawan presented the award at the 34th annual convention in Palembang city. PANGANDARAN BEACH, West Java. Celebrating club's 12th anniversary and the assignment of new Board of Directors. Fellow members took the opportunity to gather for club's sharing, recollecting & consolidating and having fun on the beach. This is the start of "In Harmonia Progressio" motto from Club President, Daniel D. Utama.